Area:Land 811 km². Freshwater 0 km². Exclusive economic zone 3,550,000 km². Terrain: Mostly low-lying coral atolls surrounded by extensive reefs. Includes three island groups Gilbert Islands, Line Islands and Phoenix Islands. The capital, Tarawa, is in the Gilbert group. Climate: Tropical maritime, hot and humid, moderated by trade winds. Temperature varies between 25Â° and 33°C. Geography: 20 of the 33 islands are inhabited. Banaba (Ocean Island) in Kiribati is one of the three great phosphate rock islands in the Pacific Ocean. Economy: Important industries include fishing and handicrafts. Export commodities are copra, coconut, seaweed and fish. Brine shrimp (Artemia salina) was imported for trials in the hypersaline ponds of Christmas Island in 1971. Several recommendations were put forward by consultants regarding feasibility of the project. Production was encouraging but constraints attributed to physical (heavy rainfall experienced in 1976) and biological parameter and the management of the culture system led to a halt of the brine shrimp project in 1978. Milkfish (Chanos chanos) culture has been a tradition in the Gilbert group. Fry collected from the lagoon are reared in ponds for grow-out to suitable size for subsistence consumption. Several projects were conducted on the culture of milkfish to be used as bait and food mainly in Tarawa, Temwaiku, Ambo fish farm, and Kiritimati. In Kiritimati, ponds used for the cultivation of brine shrimp were modified and developed to accommodate the rearing of milkfish (Chanos chanos) and other finfish such as bonefish (Albula vulpes) that would provide food for the locals. Export of milkfish have been tried with unsuccessful result, due mainly to market competition on the international market. Mullet fry (Mugil sp.) were seasonal but were found to be abundant in tidal creeks in certain locations. Experimental polyculture with milkfish was carried out and good growth was reported. Tilapia (Oreochromis mossambicus) was introduced to inland fisheries in 1963. 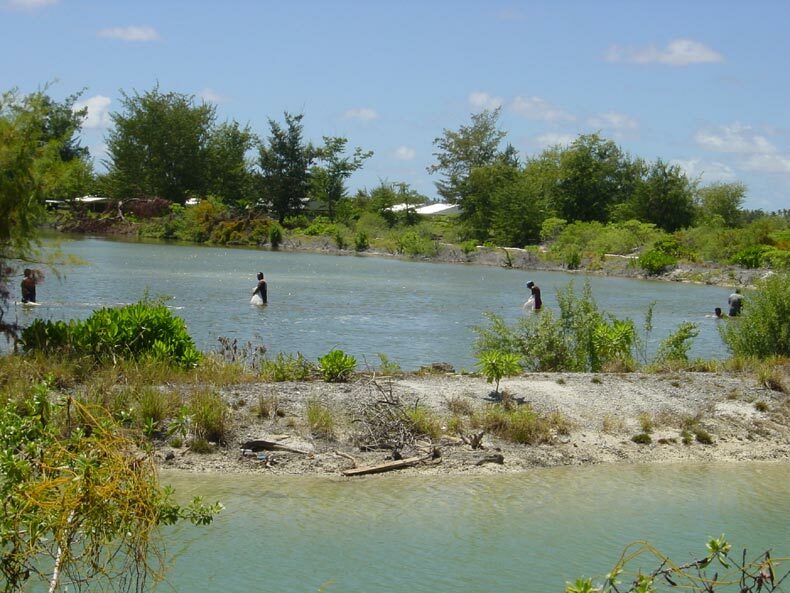 Fingerlings were stocked into existing ponds in Tarawa and the outer islands. The purpose for introducing this species was to cultivate it as bait and food fish. This introduction was not welcomed after tilapia reproduced prolifically and affected the more favored milkfish cultured in ponds. Efforts were then made to eradicate tilapia as it was not accepted as food by I-Kiribati. Currently, tilapia is being utilised for alternative purposes such as livestock feed, form part of fish meal and used as fertilizer. Farming of eucheuma seaweed began in 1977 in Christmas Island. The species utilised was Kappaphycus alvarezii. Culture trials proved successful and this was further expanded to the Gilbert group. Assistance was granted under the New Zealand bilateral aid progamme and teh European Union and exports of seaweed to US, New Zealand and European markets followed. The national company, Atoll Seaweed Company Limited established was given the full responsibility to trade, expand and develop the seaweed industry and has given some good results over the past years. - Maintain seaweed farming and explore options of securing a better return for the product. These activities focus on the principle of generating revenues from accessible indigenous marine resources that can be developed with low capital investment. This allow outer islands community to be able to carry out these activities on their own with less financial input using simple farming and husbandry technology as had been successfully demonstrated in seaweed farming. Also in line to this policy, this development will look into ways of developing potential aquaculture projects that would achieve the goals and objectives of the Government, based on the above principle. 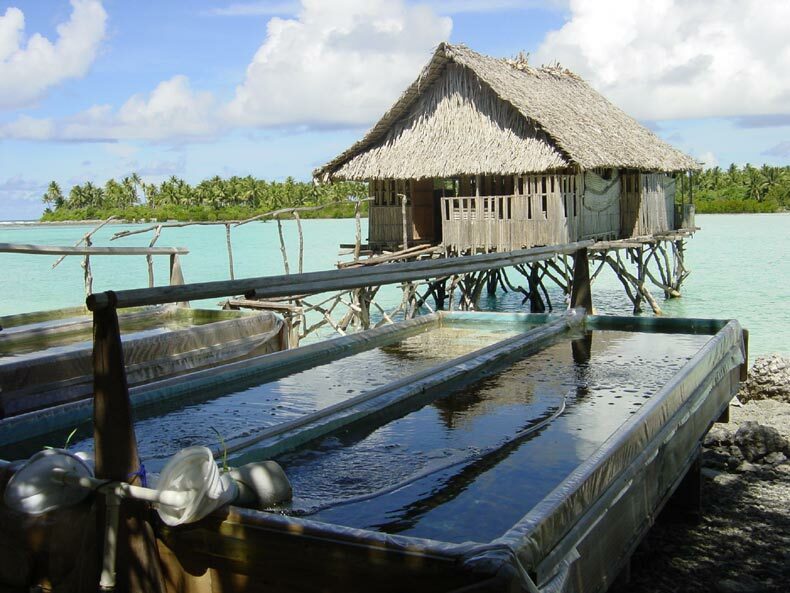 Through this policy, both locals and overseas companies are encouraged to invest in the development and expansion of the aquaculture industry in Kiribati. Farming of seaweed (Kappaphycus alvarezii) is an important activity in the Line atolls of Kiribati. The production from the industry has peaked at 1,438 tonnes of dry seaweed in 2000. The Atoll Seaweed Company, the privatised government agency responsible for development is expanding the industry to include other atolls. Total dry weight of seaweed recorded for 2003, 2004 and 2005 were 490, 638, and 304 tonnes respectively, and predominately from the Line Island. Government programs in hatchery production and farming of black lip pearl oyster are ongoing. After ten years of planning, research and development the first pearl harvest at Abaiang atoll was produced in September 2003. If every is successful, the next harvest is expected in 2008. Research in hatchery production and rearing of white teatfish sea cucumber (Holothurian fuscogilva), giant clam (tridacna gigas), trochus (Trochus niloticus) are still being carried out. Presently we have encountered difficulties in acquiring suitable brood stock sea cucumber necessary for spawning run. On several occasions, encountered high mortality of brood stock while being kept for breeding. 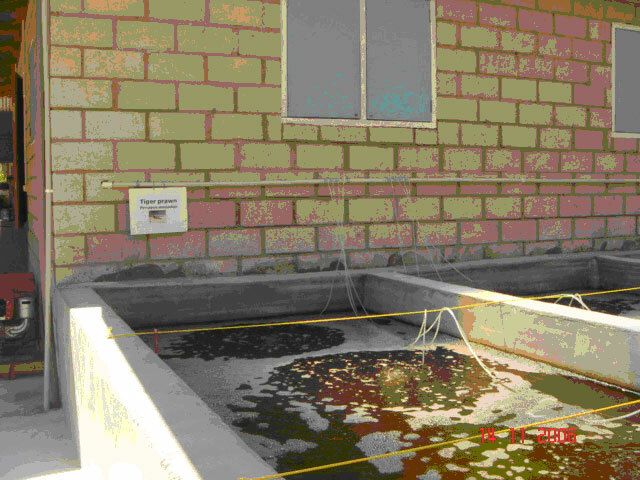 Trials in rearing and breeding of commercially valued species such as tiger prawn (Penaus monodon) are on going at the Ambo hatchery, with expected results forth coming in 2007. Traditional and integrated farming of milkfish (Chanos chanos) in ponds at Temwaiku still continues. Assistance is being sought with OFCF to improve the existing farming method to a profitable level. One small scale exporter of giant clams for the ornamental trade is based on Tarawa. The company is expanding its activity to nearby island in Abaiang where giant clam occur in abundance.